Governance, Risk Management, and Compliance or GRC is an umbrella term covering an organisation's approach across these three critical areas of business risk. Being closely related, governance, risk and compliance activities are increasingly being integrated and aligned, in order to avoid conflicts, wasteful overlaps and gaps. 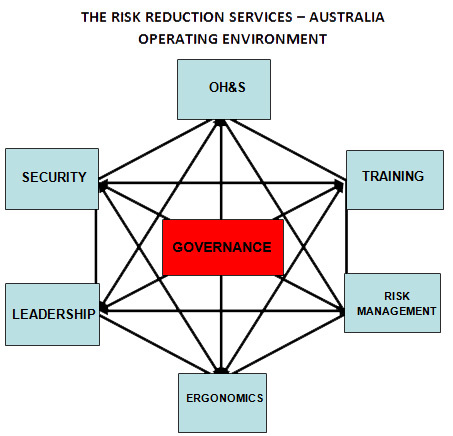 Risk Reduction Services – Australia’s comprehensive approach to your governance requirements can bring together the elements of GRC plus the key enabler functions of Training, Leadership, Security, Ergonomics and safe workplace practices (OH&S). We can tailor our approach to address the needs of your unique governance risks. Risk Reduction Services – Australia can conduct governance gap analysis, compliance, audits, training, strategy workshops and assessments. If you need Governance, Risk, and Compliance advice or assistance please contact us. "We can tailor our approach to address the needs of your unique governance risks."